Situated in a beautiful Southwestern setting, our Yuma hotel's blend of hospitality and style is sure to please both business and leisure travelers. To make our guests feel comfortable and relaxed, the Radisson Hotel Yuma features lavishly appointed guestrooms, complimentary hot breakfast buffet, high-speed wireless Internet access, a 24-hour Business Center, Fitness Center, Indoor Pool and Whirlpool with a large Outdoor Pool and Whirlpool. The Market Grill Steak & Seafood is Radisson Yuma's top rated Full Service Restaurant serving American Comfort Cuisine. This property also features over 3,000 square feet of versatile meeting space. 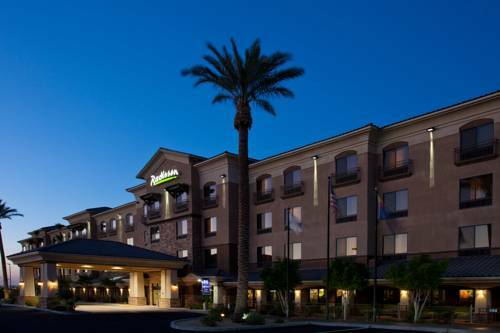 The Radisson Hotel Yuma is also recognized as a 3 Green Key Hotel. This hotel has taken significant steps to protect the environment. Strong environmental programs, best management practices, training programs and engineering solutions have been implemented which have benefited the environment and local community. An Upscale-Casual Bistro - Is located at the Radisson Hotel Yuma; Reservations welcome (928) 373-6574. 3,054 Square Feet of versatile meeting space with 4-MEG High Speed Internet. AV equipment and catering available onsite. Please contact the local sales department for additional information. Built in 1928 was initially used by the Army as an air base until its deactivation at the end of World War II. The Air Force reactivated the base in 1951 as Yuma Air Base; it was transferred to the Navy in 1959 and became MCAS Yuma in 1962. Open 8 - 5 Mon - Fri, gift shop, museum, video room. Gunfight at high noon and 2:00 p.m. from October through April. 1 Prison Hill road 928 783-4771 Downtown Yuma. Admission is: children under 12- free, 12 - 18 yrs - $2.00, 19 - 59 yrs - $3.00, 60 + yrs - $2.00, members - free. The phone number is (928) 782-1841. Parking is available in front of the buildings, in lots across the street and next to the Molina block.